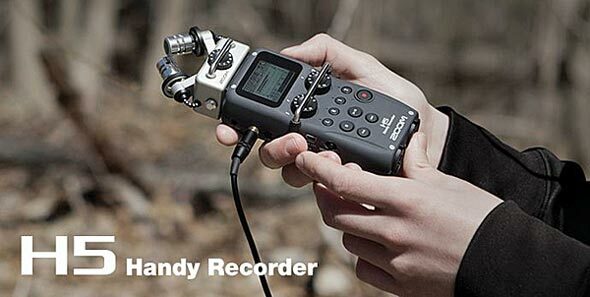 Zoom Corporation offer some innovative, great-sounding recorders, not least their H6 recorder, the first to offer a modular approach to portable pro-audio. And the H5 takes that influence to evolve even further to meet the needs of creators on a budget. The H5 provides four tracks of simultaneous recording and, like the flagship H6, it can use all Zoom's interchangeable input capsules, allowing you to choose the best microphone for every recording situation. 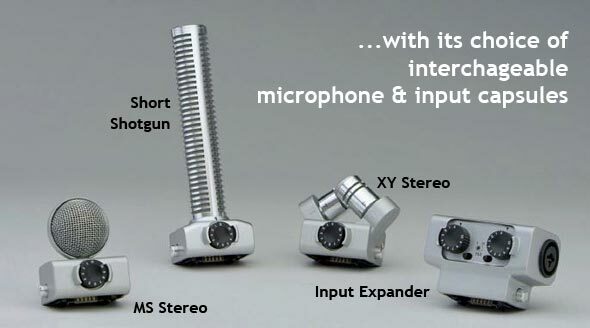 Five interchangeable input modules are available - the H5's own X/Y Stereo capsule (included) with improved handling & vibration reduction, plus an optional large diaphragm X/Y capsule (originally designed for the Zoom H6), an MS Stereo module, a Shotgun and a Dual XLR/TRS Combo Input Expander. Coupled with their new, advanced preamps each of these delivers excellent recording quality. The flexible and powerful H5 provides everything you need to create stereo & multitrack recordings, audio for video, and state-of-the-art podcasting, broadcasting and electronic news gathering. Now please watch our H5 video demo and then click on the menu below for even more detailed information about every facet of the H5. THIS RECORDER COMES WITH ONE FREE 2Gb SD CARD TO GET YOU STARTED. SEE BELOW FOR ALL OUR APPROVED SD CARDS.